Rose Blossom Legacies: Last Day for the June Stamp of the Month! 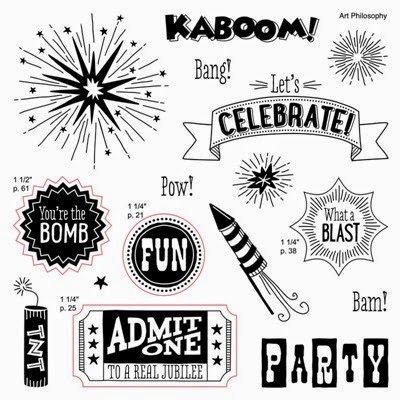 Today is the very last day to order KABOOM!, the June Stamp of the Month. I wanted to make a card using non-traditional colors with this set so that you can see it can be used all year round. This card doesn't take many ingredients - white daisy cardstock, black chevron basic paper fundamentals, honey washi tape, and black archival ink. You can use black dye ink as well, but I like the richness of archival ink. I put a little honey washi tape on the back of a clear button to make my own embellishment for the center of the fireworks. Someone requested that I start showing the inside of my cards, so here we go! Don't you love this set? With a $50 purchase, you can add this set on for just $5!